It’s starting to feel like fall here in the Midwest, so I have been busy creating fall floral centerpieces. The craft stores all have a nice selection of fall florals and supplies now, so it’s easy to pick something up to incorporate into your fall decor. 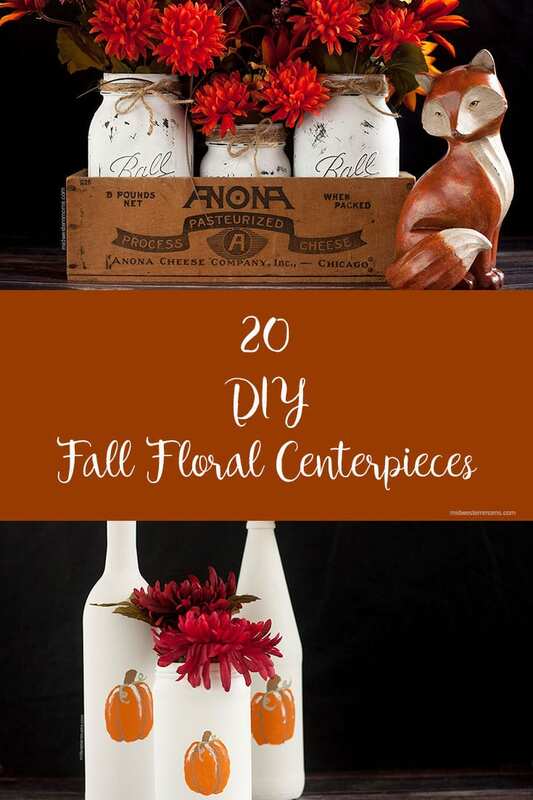 Browsing Pinterest gave me several ideas for fall floral centerpieces that I could make. This list, ranging from simple to elaborate is sure to leave you with some project inspiration to get ready for fall at your house! Distressed, chalk mason jars placed inside of an aged box give this look a rustic feel. Filled with a beautiful arrangement of fall flowers. These hand-painted pumpkin bottles are sure to add charm to any table. Cute DIY floral arrangement using a craft pumpkin as a vase. What an eye-catching centerpiece! This long box is used to make 17 different centerpieces throughout the year. Check out the fall ones. Gorgeous! Loving the florals placed into this birdcage for a table decor idea! The texture in this centerpiece is amazing. I love the tiny details, such as the acorns in dishes, and candles to accentuate this piece. A great idea using acorns and fall floral stems to make a fall centerpiece. Using a real pumpkin in your centerpiece? A great top on adding the styrofoam on top of your pumpkin rather than hollowing it out to use it as a vase. A ton of great inspiration for fall centerpieces! What a beautiful collection of fall floral centerpieces. My favorite is the one from Country Home in the vintage box. Several great ideas for farmhouse style fall floral centerpieces. I love the buckets of flowers with the pumpkins. Pumpkins and hydrangeas sit atop a silver tray in this beautiful centerpiece. I love the idea of using succulents in fall decor. Displayed in a small wooden box they look very charming. What a great idea to use a tree stump at the focal point of your centerpiece. Gives it a rustic look. I love the details in this tray. A few floral stems added to the pitcher to make a great centerpiece. Great tips on adding gourds and pumpkins to a clear vase and displaying a beautiful fall arrangement. These centerpieces included in the fall home tour are gorgeous! Very vibrant. Amazing collection of beautiful floral centerpiece and decor ideas for fall. Check out the centerpiece using antlers and a pumpkin! I had to include this collection for even MORE centerpiece ideas. The one with apples is seriously catching my eye right now. Have you started decorating for fall yet? Wow thank you for including our sunflower centerpiece. Here in the New England states, the beautiful autumn leaves are starting to cover our trees. This is the one season that I wish would last longer! Already, there is a distinct colder ” nip” in our evening air that tells me that it’s going to be a cold, cold winter. But, forgive me for side-tracking. In the woods, right now, is the Japanese version of “Bittersweet”. While the Purists are not happy with this intrusion into our New England landscape, I find it very attractive. This version is on a vine that wants to wind around our large trees (possibly choking them….. If you have never seen Bitter-Sweet berries, they begin with their summer life as a basic sort of pale orange berry. But, when the autumn is upon us, as the berries dry, they split (while remaining on the stem), and expose a beautiful, shiny dark orange interior. If these branches are handled carefully, the berries will remain on them, and dry, while maintaining this beautiful two-tone color! I have discovered, the that a quick shot of a good hairspray, will keep the fragile little pale orange “peelings” intact longer.